Now I've tried quite a few green teas, Jasmine being my favourite, this Salted Caramel Green Tea from Twinings sounded both interesting and also a possible recipe for disaster. For starters I prefer sweet caramel in chocolates, rather than the salted variety. Salted caramel is okay in an Eddie Izzard "Cake or Death?" sense, but I wouldn't rush out and buy any or choose to eat (or drink in this case) salted caramel unless the boss (Cinabar) expressly wanted a blog about it. Don't get me wrong; I like Twinings, and that's certainly the good side of this review. I've never had a bad cup of Twinings, but then again I've never tried all their flavours either. I've drank quite a few of their flavours mind, from Assam to Yunnan, Darjeeling to Keemun and so on... I've enjoyed cups of their original Green Tea and their Jasmine Green Tea, but have a tendency to stir clear of their fruity flavours as they don't agree with my palete. 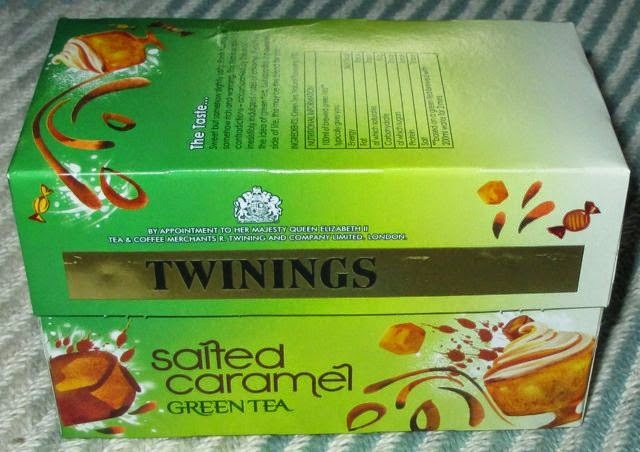 The box recommends brewing this Twinings Salted Caramel Green Tea for no more than two minutes as "any longer and you'll lose the delicate taste." Does that mean three or four minutes brewing time produces something akin to sweet brine? I have a bad habit of brewing tea to within an inch of the tea bags life. On occasion I've left the tea bag in by mistake and ended up wearing it on my nose. Most embarressing on one previous occasion in a rather serious meeting where a very high profile project was failing miserably, but then again it did lighten the mood! On opening the box there was a strong smell of salted caramel even through the sealed envelopes surrounding the tea bags. For a change I followed the suggestion on the box and let this tea brew for a couple of minutes or so. There was a strong aroma of caramel from the tea with a dash of saltiness at the end of the smell. Once cooled this drink had a light caramel sweetness to start with moving to a surprisingly smooth almost creaminess, their was a mild bite from the salt and then an aftertaste of caramel. Don't get me wrong as the saltiness lingers a little too, but somehow complements the smooth sweet caramel giving it a bit of an edge. The caramel flavour didn't have a hint of syrup as some added caramel flavours can have in drinks, and even if it did, the saltiness would kick it's backside right out of the mug! 20 tea bags at net weight 40g. Per 100ml at 1 calorie with traces of fat, salt and sugar. Ingredients included; green tea, natural flavouring (7%). Also available in this range; Ginger Bread Green Tea, which sounds rather Christmassy! Why does all caramel have to be salted these days? It seems to be quite the fashion. This tea sounds dreadful though, glad to hear it wasn't as terrible as it appears! I know Salted Caramel have been a big trend of 2014... I tried the tea as there was some still in the cupboard I know Spectre didn't mind it - but I shan't have another.